It was a perfect winter night as Russian President Vladimir Putin and Egyptian President Sisi exited their heavily guarded convoys and entered the Cairo Opera House. 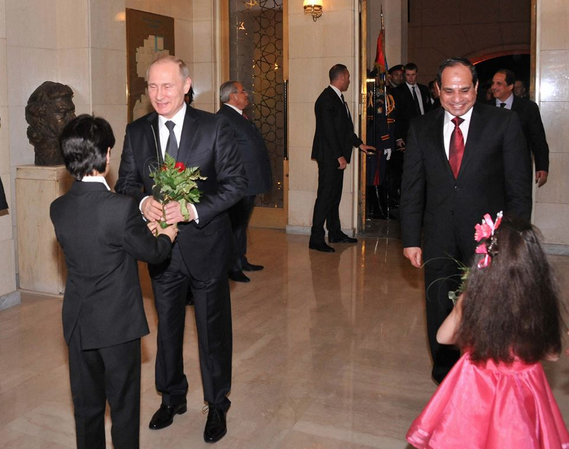 Along with Ambassadors from embassies in Cairo, Putin and Sisi arrived to be met with girls in pink ballet tutus and smartly dressed boys in tuxedos. Yet, the night was only beginning. 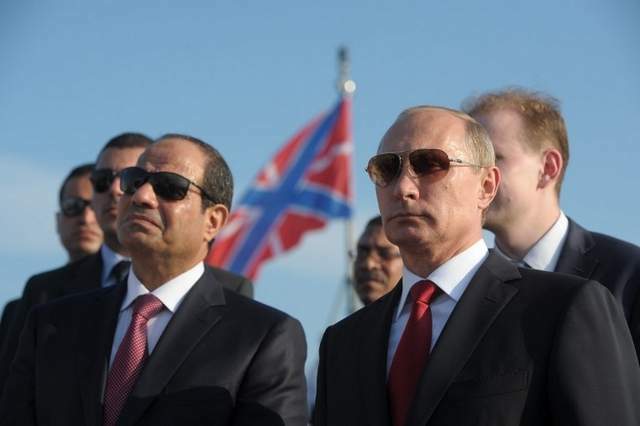 After what the Dutch Ambassador to Egypt described on Twitter as a “star performance” at the Opera House, Sisi invited Putin to a private dinner at the Cairo Tower, which offers 360 degree views of Cairo. During the dinner, the Russian and Egyptian presidents exchanged souvenirs and continued discussing the close relationship between their countries. However, serious business between the two world leaders, who have made waves in the media lately, commences tomorrow morning. Despite having a 30 minute friendly catch-up at Cairo International Airport, the two Presidents are expected to hold longer discussions tomorrow before facing the press on Tuesday. Days after the visit, the Russian President openly advocated his backing of the former Military Chief’s presidential bid, before Sisi had even announced his candidacy. Within a month after becoming President, Sisi found himself once again in Moscow, this time being offered a jacket with a large, red star from the Russian leader. With a sour relationship with US President Barack Obama, President Sisi saw the Russian efforts as an opportunity to both pressure the Americans while also forming a closer bond with the Russians. 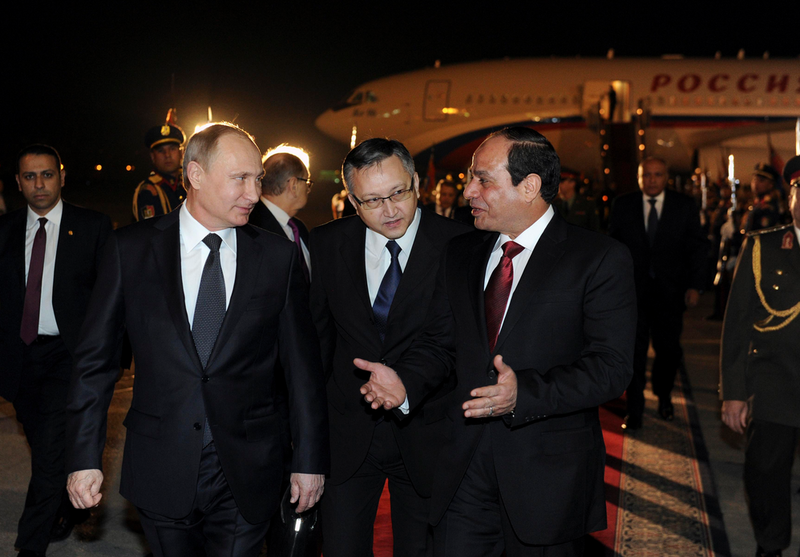 Egyptian and Russian officials are expected to discuss arms deals between the two countries during Putin’s visit. 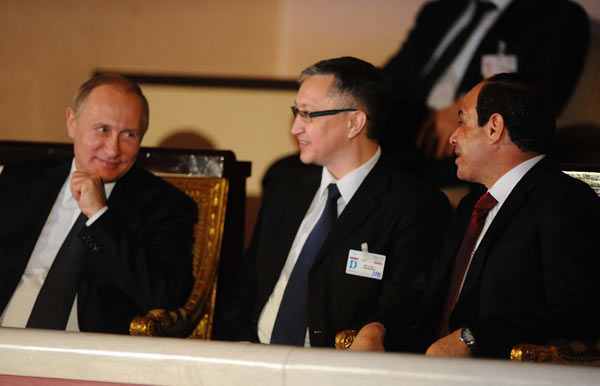 In September 2014, it was reported by Russian State Television that Egypt and Russia were on the verge of signing a historic arms deal between the two nations worth more than $US 3 billion. Meanwhile, in regards to trade between the two countries, Russia’s Putin announced on Monday that there are discussions to exclude the US dollar in bilateral trade between Egypt and Russia. Among the other issues that are to be discussed between the Egyptian and Russian leaders are topics such as the Libyan crisis, the Palestinian-Israeli conflict, the civil war in Syria, and the Islamic State and terrorism.